In a grab-bag column this week, I answer some questions about tagging a bunch of singles as an album, and I discuss tagging WAV files in iTunes. I also take on the HD-versus-SD debate—as in, is it worthwhile to pay more for HD video content? Q: I’ve got a number of singles that are tagged individually, but I’d also like to group them as an album. I don’t want to make a playlist, but I do want them to show as an album in all views in iTunes. How can I do this? You can’t tag the same songs in two ways, so what you need to do is duplicate the tracks. Start by making a new folder on your desktop. In iTunes, select the tracks you want to “albumize,” and then drag them to that new folder to copy the tracks. You can set the album name for any group of tracks in this window; they don’t have to make up an actual album. Next, in iTunes, create a new playlist. Name it whatever you want—you’ll use it only temporarily for tagging these files. 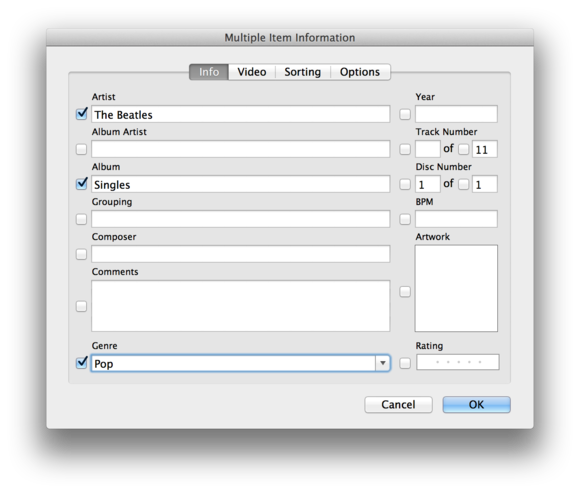 Select the playlist and drag the files from the folder on your desktop to the iTunes window. Select all the files, press Command-I to display the Multiple Item Information window, enter the name you’d like to use in the Album field, and click OK.
You’ll now have these tracks twice: once as the album you just created, and a second time as the individual singles. Q: I have just spent several months editing and correcting all the genre, artist, and album-name tags for over 1200 CDs in my iTunes music library, but I had ripped the CDs in WAV format. I understand that iTunes doesn’t handle tags with WAV files very well. I am afraid I might lose all my alterations if iTunes upgrades to a newer version or tries to organize all my music in its own format without my knowing it. What can I do to ensure that I don’t lose these tags? You’re right: WAV files don’t like tags. This isn’t an iTunes problem; it happens with other software and hardware as well. You can tag WAV files in iTunes, but those tags aren’t embedded in the files. As long as the files live in your iTunes library, you’ll see the tags. If you move them to another computer, however, you won’t see them. This smart playlist will find all your WAV files. Choose File > New > Smart Playlist. Set the condition Kind contains WAV. This rule will show you all the WAV files in your iTunes library. Go to iTunes > Preferences > General, and click Import Settings. From the Import Using menu, choose Apple Lossless Encoder. Click OK, and then click OK again. In your smart playlist, select all the tracks, and choose File > Create New Version > Create Apple Lossless Version. iTunes will start converting your files. Since you say you have 1200 CDs, the process will take a while; you might want to do this step overnight. In the WAV playlist, select all the files, and press Option-Shift-Delete. iTunes will ask if you want to delete these files; click Delete Songs. Another dialog box will ask if you want to move these files to the Trash; click Move To Trash. You’ll end up with a library of Apple Lossless files that have your tags embedded in them and occupy much less disk space. 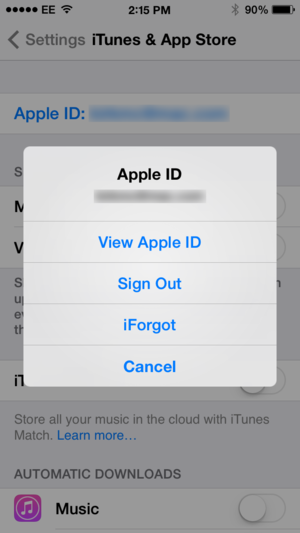 The iTunes & App Store settings let you sign out of your account and sign in again. Q: My iPhone has switched from the UK iTunes Store to the U.S. iTunes Store, and I can’t switch it back. Can you help, please? If you go to Settings > iTunes & App Store, you’ll see your Apple ID at the top of the screen. Tap that, and then tap Sign Out. Next, enter your Apple ID and password, and your iPhone should be set up for the correct store. Q: I buy a lot of TV shows and seasons on the iTunes Store, and I’ve always struggled with deciding whether to buy HD or SD. I watch the shows on my iPad, my iPhone, and my TVs—a 32-inch Sony and a 47-inch LG. So far I’ve always purchased the HD versions, but if I look at an SD preview on my TV, I can hardly tell the difference. Is it worthwhile to spend more for HD videos? There’s no one-size-fits-all answer to this question. I’ve always believed that if you can’t see the difference—or, with music, if you can’t hear the difference—then it’s not worth the extra money. It’s up to your eyes and ears. However, think about the future. You currently own a 47-inch TV. You might not see the difference between HD and SD on that screen, but if you were to buy a 60-inch TV in a couple of years, would the difference become obvious? If so, you might regret not buying HD content now, if you’re planning on rewatching any of it in the years to come. I’d try to find a friend with a bigger TV and play some of your SD content on it (or just look at a standard-definition DVD). If you still can’t see the difference, then don’t feel guilty about saving a few bucks.